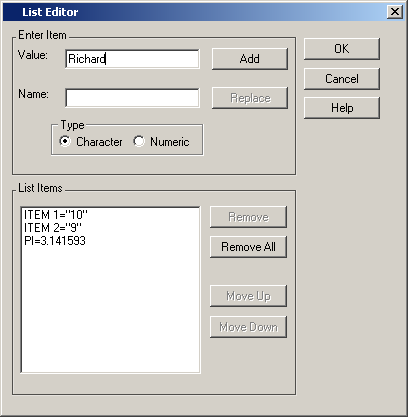 A simple SCL list is one having only numeric and character items. This SCL entry invokes the SAS attribute editor sashelp.classes.simplelisteditor.frame. Run the SCL to create a new SLIST entry. 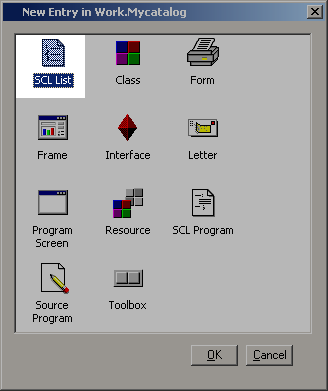 The SCL can also be invoked via SAS Explorer to display a simple SLIST. 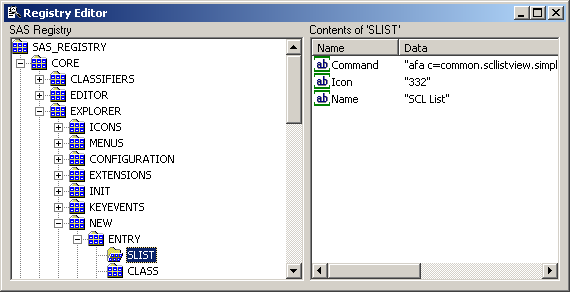 The SCL can also be invoked via SAS Explorer to create a new SLIST! Use command RegEdit to update the SAS registry. Add new String value. Name = "Name", Data = "SCL List"
Add new String value. Name = "Icon", Data = "332"
Add new String value. Name = "Command", Data = "AFA C=Common.SCLListView.SimpleListEditor.Frame action=new entry=%8b.%32b.UNTITLED.SLIST"